Most of the time when we hear "food allergies" we tend to direct our focus on children. You may be surprised to know that around 15% of these are individuals who develop what is called adult onset food allergies. Imagine one minute you are seated in a restaurant with friends or family eating one of your favorite meals and within minutes of your beginning to eat something seems very wrong. Your eyelids begin to swell, your throat begins to tighten and breathing become labored. It goes without saying the fun evening out comes to an abrupt halt as you are whisked away by ambulance to the nearest emergency room. When adult onset food allergies happens it can be very a life altering and frightening event. Just like with children with allergies, it becomes vital to begin to read food labels, question waiters when ordering, wear a medical alert and carry a life saving epipen. Of the top food allergens shellfish is the most common. 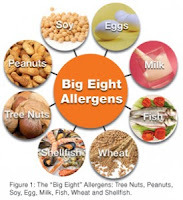 Other common adult allergens are tree nuts, fish, soy, peanuts, wheat, identify and prevent experiencing a severe/life-threatening incident. As always...the more information you know the better...read the article "When Food Allergies Strike As An Adult" to gain more information on managing and living with them.